Search for "Card Valet" in the Apple App Store or Google Play and download the app straight to your mobile device. When you first open the app, you will be prompted to "Login" or "Register." Completing the registration process is as simple as entering your card details (Card Number, Expiration, CVV), and creating an account Username and Password. Whether blocking a lost or misplaced card, or setting spending limits based on transaction amount, transaction location, or merchant type, CardValet is a quick and easy way to keep track of all of your American First debit and credit cards. The best way to safeguard your account against fraud and identity theft is to continually monitor your accounts using Online Banking or our Mobile App, and reviewing your statement transactions promptly when received. If you feel your account has been compromised in any way, immediately tell us of any errors or unauthorized transactions. You are not responsible for fraudulent transactions as long as you report them immediately. CardValet is a registered trademark of Fiserv Inc. or its affiliates. CardValet features are offered as a free service to American First Credit Union cardmembers. Cardholders can download the CardValet app which is available for both iPhone and Android (Apple® or Google® Play). The app is user friendly and convenient. 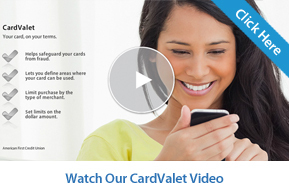 CardValet will walk you through setting up your account and registering you card(s). CardValet will aide in our continued efforts to prevent fraud and identity theft. Click here for the quick reference guide. Need Help With Card Valet?